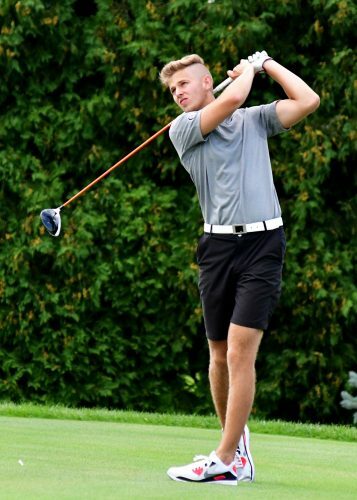 BATH, Mich. – Grace’s men’s golf team enjoyed two rounds of the Spring Arbor Invitational on Monday. The Lancers placed eighth out of 12 teams at Eagle Eye Golf Club. Tristan Nienhuis headlined Grace’s performance with a fifth-place showing out of 74 competitors. Nienhuis finished with two identical rounds of 71 and was five strokes behind the overall medalist. Tim Rata was second for Grace as a freshman. The former Warsaw Tiger shot 79-78. Chad Spencer carded a 158 for the tournament (81-77), and Isaiah Brown was one stroke behind him (81-78). Cameron Bates was the fifth scorer for the Lancers with his 88-83. The Lancers will prepare next week for one of the biggest tournaments of the year. On Sept. 25-26, Grace will host the NCCAA Midwest Regionals at Stonehenge Golf Club. The winner of the regional tournament will receive an automatic bid into the NCCAA National Championships.